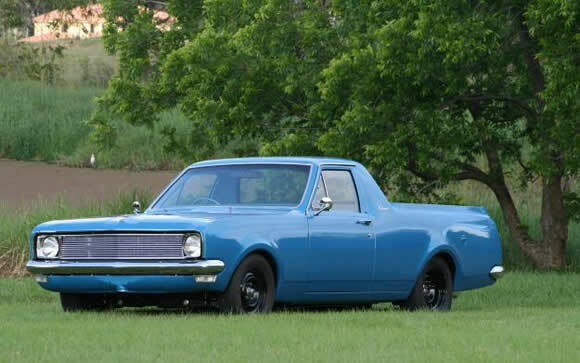 I want this ute! Beautiful motoring Holden style. I saw it on oldholden.com and it's owned by Andrew. Great story because the HG was brought back to life over six years and finally finished in November 2008. What's also cool is his mum brought it new in 1971 to drive her dogs to shows. I know my mum wouldn't have brought a ute in 1971. She did drive a Studebaker though. That's another story. Back to the HG. Andrew has restored it back to stock along with the 14inch steel wheels and added in a great handmade grill. It adds a nice touch that would make it really stand out in a row of Aussie utes but keeps the stock look. Under the hood though it's a different story because Andrew has fitted an 11sec package with a 450+hp 383ci V8 and Ford 9inch differential combo. He has another set of wheels for when he wants to flaunt the grunt a bit more. What I also like about this car is the detail and that there is some cool touches under the hood like an aluminium cold air intake. It's worth taking a look at all the pics on his site and I'm going to keep an eye out for Andrew at car shows because it turns out he moved to New Zealand and is building some beautiful cars over here. See pics of the build here.